"We start fresh every day," is Chef Sal’s rule of thumb. As a guest chef on the Food Network, Sal bring his experiences as a world traveler home to his customer’s delight. And the magic of a meal here, is our ability to create an atmosphere that ensures your private dining experience will be absolutely delicious, from start to finish. We can help you host a myriad of social and/or business functions - anniversaries, bridal or baby showers, corporate events, birthday parties, community meetings, holiday celebrations and more. 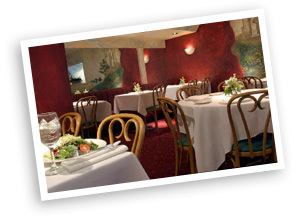 We can accommodate up to 60 people in our dining room. And, we even have a private dining room that seats 25-30. Well help you customize the perfect menu for your occasion and your guests. If you can’t come celebrate here - you can create some dimaio cucina magic at your own house. We’ll help you customize a menu of half trays and full trays that’s sure to make every guest happy. Choose from salads, appetizers, pastas, sides and more.